At this year’s ALA Annual Conference, the AASL session “Unpacking ESSA for the Library Eco-System” focused on the need to identify stakeholders and build coalitions within communities. The following is panelist Dorcas Hand’s recounting of the coalition formed after the loss of two highly qualified librarians in the Houston Independent School District. The Beginning, 2013: A Houston Chronicle article detailed the loss of two more HISD librarians, both well-respected leaders in the district, but a new principal in the site-based management system didn’t understand the value of school librarians. This loss in my own community was the proverbial straw for me: I found my voice. Immediately, I contacted HISD Library Services who connected me to Debbie Hall, a retired school librarian with many years in HISD campuses and in the district office. We began to join our voices together to say the important things that district employees were unable to say. We began to hold meetings in my house after school, inviting anyone who might be interested. A small group showed month after month as we sorted through many possible actions. Debbie and I attended a meeting of HASL, the organization of HISD librarians, to talk about our willingness to work on their behalf. Still, most were afraid to speak up, but we began to get notes with questions, concerns, and ideas. A huge concern was the district commitment to site-based management and the refusal to allow any training about strong school libraries – or even any communication by Library Services Managers directly to principals. So, Debbie and I worked entirely outside district channels, keeping the school librarians informed, of course. 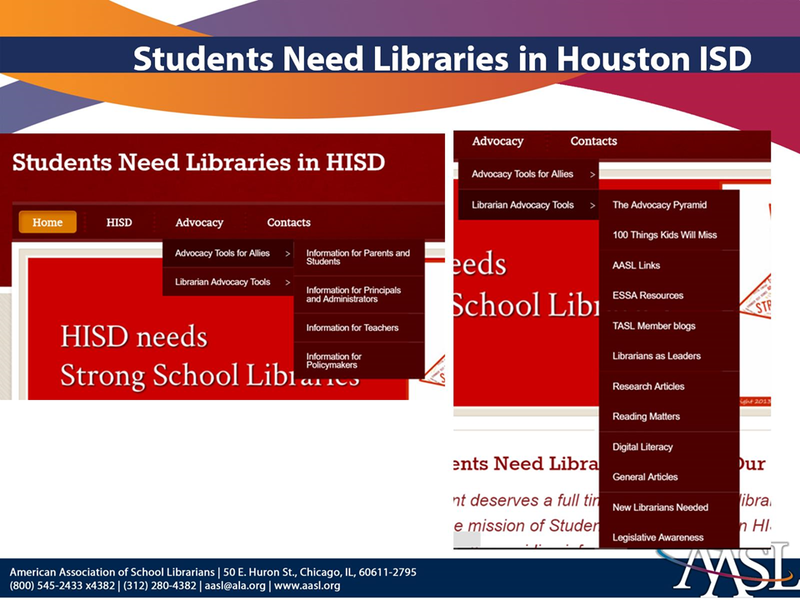 We also launched a website, Students Need Libraries in HISD, where we could consolidate information about school board members, school board districts, and advocacy tools for interested stakeholders and allies. We have a stated mission and several audiences: school board members and candidates; voters; school librarians needing support; even campus allies in need of talking points. We have shared this URL widely and are seeing statistics that reflect its usefulness. You’ll notice in slide 4 how we break the advocacy support articles down for allies, stakeholders, and practitioners. Debbie looks at data we have culled from public records and HISD information streams and develops infographics we post to the website for all to see. We show voters the status of school libraries in each of the nine school board districts, and we contact specific school board members with our findings. We send them articles and data to help them understand better the equity issues they could be working to solve. In fall 2014, Debbie moved the meetings to a local grocery store’s free community meeting room on a Saturday morning and decreased the frequency to 3-4 times a year. Attendance increased. We’ve had a school board member attend as a guest speaker and a vendor rep, as well as parents and community activists; we also plan activities to get ideas rolling. We work closely with another group, Community Voices in Public Education (or https://www.facebook.com/houstoncvpe/), who are working to increase awareness of testing pitfalls and problematic teacher evaluation methods; they are happy to have our voices and to contribute theirs to our efforts. Grassroots are where it really happens. We also began attending school board meetings. We wear t-shirts that identifies us as librarians, and we don’t even speak very often but we are noticed. We have begun conversations by e-mail and by attending campaign events with several board members, especially around equity and literacy. HISD has 249 schools – only 34% have certified librarians. Twenty-eight percent have paraprofessionals, another 24% have teachers in the library. Fourteen percent have closed the library completely. We are learning to use our data better to hook stakeholders to understanding the importance of having a certified school librarian in schools. Remember how I mentioned we have been attending school board meetings and building relationships with board members? I don’t think I mentioned that when Students Need Libraries (SNL) began in 2013, the word “library” was never said aloud in meetings – ever. Fast-forward to January 2016. The outgoing school board president added to the agenda a proposal to mandate on every HISD campus a nurse, a counselor, and – yes – a librarian. The item was never voted on mostly because the district is also facing a $104 million budget shortfall, but discussions of EQUITY for HISD students got the proposal out there. We continue to work behind the scenes, and our following of current HISD campus librarians is growing, as is their willingness to speak out. Thanks to then ALA President Sari Feldman and AASL President Leslie Preddy for their letter to the editor (Houston Chronicle) in support of this item. SNL-HISD is having an impact. In February, Hogg Middle School re-opened its renovated library. This renovation was the work of the new campus librarian Mary Chance and the new building principal, Angela Sugarek. In addition to scrounging funds and labor for a simple (and transformational) makeover, they compiled a strong infographic titled “HISD Libraries by the Numbers” that illustrates the connection between the number of library books borrowed per student and test scores, all publicly available district data. They took the further step of comparing the percentage of students not borrowing any books with the TEA school ratings. What can you take away from the SNL example? First, AASL matters. Everything Debbie and I coordinated mirrors directly the recommendations of the AASL toolkits, AND our website pushes readers to AASL resources, supporting the leadership role AASL plays in our profession. Additionally, collaboration matters. HISD librarians are grateful for the support, especially when we take it to the school board and district administration. Community Voices in Public Education appreciates librarians as teachers and our contributions to their activities. Several school board members recognize our voice now in ways they didn’t 2 years ago. We are definitely still learning how to be most effective for HISD students who need our services – but we’re out there working the system. And we are making a difference – slow and persistent is the name of the game. We have a meeting next week!